A custom take on the "Legend Blue" Jordans. The recent release of the "Legend Blue" Jordan 11s means that there will be plenty of custom pairs in the near future that work with that shoe as the base. This one, created for Detroit Lions quarterback Matthew Stafford, does just that. Stafford's Lions teammate Eric Ebron gave him the sneakers, which are a wedding gift. 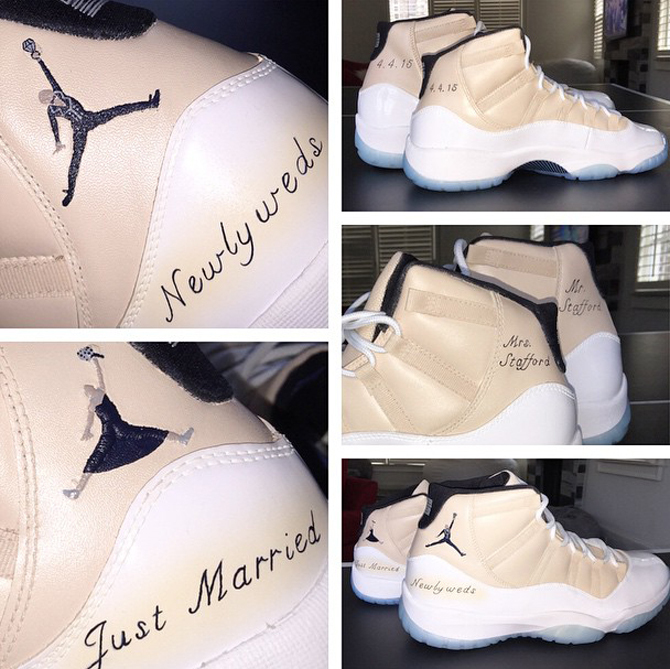 The sneakers read "Just Married" and "Newlyweds" on the left and right shoe, respectively, and rework the Jumpman logos to look like a bride and groom. The pair also pulls away from the "Legend Blue" palette by replacing some of the white sections on the upper with a cream shade. While the custom is a cool one, it doesn't top the Air Jordan 11 wedding sneakers that Jordan's brother-in-law brought out last year.